For the past 4 years, we’ve ventured north at Christmas time. Most people in Minnesota dream about warmer weather to the south and head that way but not us! We like to get up to check on our land near Moose Lake and play around in the snow. And since we’re already that far north, we keep on going on up to Duluth. I think Lake Superior has a magical draw on all 4 of us. We started out by checking out the snow level. We plowed the snow to get to the shed, shoveled off the bridge and built a snow hut. 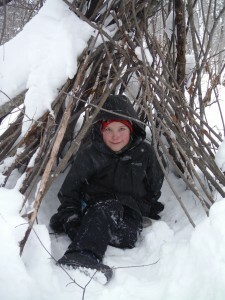 It was nice to see that Bode’s teepee he had started building in the fall was still standing. After a couple hours, we were chilled, hungry and ready to head to Duluth, so we got in the truck and headed north. After checking into the hotel and going for a short swim, we had the light display at Bentleyville on our to-do list for the night. 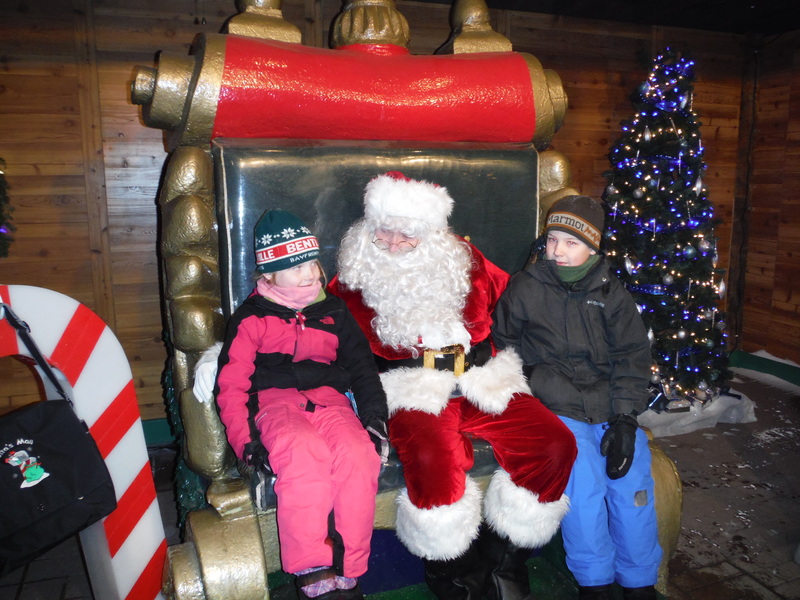 I love the lights on the shore of Lake Superior and the kids love visiting with Santa. They also like that you get a hat and cookies after you see Santa. Santa: What would you like for Christmas? Mostly it was too cold to take your hands out of your mittens to take a picture. However, Aaron did brave the cold and sacrifice his comfort to take a few pictures as we caught ships going through the canal. Want to know more about the Algoma Olympic ship? I love the ice and steam on the lake. 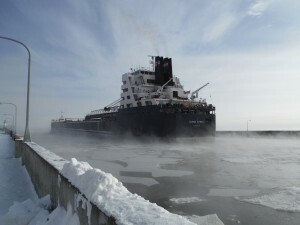 What was the temperature while we out watching the ships? I think it was -10 F or something. Don’t worry about us though. When we weren’t dressing in multiple layers to brave the weather outside, we were enjoying the heated indoor waterpark. The kids say it was a great time, so why would we go south? Whooooosh! Another year is quickly on its way out. If you haven’t been following along with our life on Facebook, where have you been? Just kidding! I try to keep it entertaining over there and I’m not much for writing these snazzy letters anyway. But just in case you came looking for more, here it is! We managed to spend most of the winter at the ski hill, including weekends and many nights after work and school. I became a pro at packing and unpacking those bags while the kids rolled into bed. Both kids got to ski at Brighton while we were Utah. I was surprised to find out after the lesson that the instructors had teamed up and taken Bode and Courtney over to a double black diamond. We’re all looking forward to that trip again. Both kids moved up to swim team earlier this year and are spending countless hours in the pool. I’m writing this as they swim laps back and forth. They are by far better swimmers than I am. When not in the pool, Courtney has spent most of the year playing hockey. It keeps her busy and active. Did you hear that Aaron skated a marathon and a half? That’s 39.3 miles on inline skates in 1 morning. I think he’s a little bit crazy, but he did it and then he signed up again. Even after skating a half marathon first and being a few months out of foot surgery, he still beat my time for the marathon. Guess I’ll have to work harder next year, especially since I know he intends to also! I’m hoping for a tailwind. 🙂 We’re hoping that more of our friends will join us too. There was a hunting season, but it got cut a bit short with Aaron being sent to Taiwan for work. They tell me hunting isn’t all killing. There’s always next year to fill the freezer full of meat. This year the freezer ended up full with the bounty of our garden and some apple trees. It was Aaron and not me that got the trip to the emergency room this year. Our track record with gardening and knives isn’t good. Nobody warned me that it was this dangerous! We’re set to do it again next year, but if I don’t have to can anything until August or September, that will be just fine. Lots of other stuff happened during the year. Fun stuff. Exciting stuff. Vacation stuff. Mundane stuff. Work stuff. Family stuff. Travel stuff. Dog stuff. Camping stuff. Kid stuff. Stuff stuff. Stuffed! I’m just happy to be able to do the things we do. Looking forward to doing lots more of the same in 2014. We hope you join us. The boy loves dogs. Dogs and boys go together. After some dog research, Aaron decided that an English Setter (specifically an Old Hemlock English Setter) would be the best dog for the family *and* for hunting. I wasn’t necessarily ready for a new dog yet, but Aaron assured me it could take two years on the waiting list. Shortly thereafter, there were two litters of pups and one was available for us. This gave me nearly two months to ready myself for having a puppy again. The catch is that we would have to travel to Rochester, NY to get the puppy. (Yep! That was a Rochester, MN to Rochester, NY trip.) Given Aaron’s lack of vacation time, that meant it would be a weekend trip and he would need me to come with to drive through the night. This sounded exhausting, but I reluctantly agreed. Until it was time to pick up the puppy, Aaron and Bode frequented the puppy update pictures on facebook, trying to decide which ones were their favorites. The puppy-to-be had even already been named Old Hemlock Blue Sky (just Sky for short). Last Thursday after work, Aaron, Bode and I got in the car (Courtney was already at grandma’s) and started the drive to New York. We crossed a lot of state lines and a lot of toll booths, but we didn’t make a lot of stops. By Friday morning, we were in New York. We planned to go see the puppies on Friday night and make our selection on Saturday morning. Until then, we had the day (who needs real sleep?) to explore Niagara Falls. It was Bode’s 8th birthday after all. None of us had been there before and we had a fun (but wet) time checking it out. Wow! Bode got literally bowled over by a large group of nearly 8-week old English Setter puppies as he came into the basement where they were. They each had a different colored collar to help identify them, but they all looked so much alike. How were we to make a selection? We had fourth choice out of the litter (but must be a female) and really any of the puppies seemed like a good choice. We played with the puppies and took them in smaller groups outside. It was tough to pick our favorites, but we got an idea, knowing that two more of the puppies would be unavailable by the time we got to choose. Bode did not want to say goodbye to the puppies that night. We went out for dinner and back to the hotel, talking about puppy selections, and made it an early night. Saturday Morning – Puppy Day! Still not quite sure which puppy we would select, we went to the home where the puppies were. One family was still trying to select their puppy and had several of their choices outside. The number one puppy on our list had already been chosen. As we waited for the other family, we played with the puppies that were around. One of those puppies stood out in wanting to play with Bode and me. We ended up taking her and another outside. It was a group effort to make our decision. It was hard, but we did it. And it was a little sad to be leaving the other puppies behind, even though they were all going to other good families that day. Shortly after making our selection, we loaded up with the puppy, now called Sky, next to Bode in the back seat and we drove off. We made several stops for Sky on the way home and she was an amazing traveler. I really had expected the worst. By 1 am, we were home. Whew! Totally beat and glad to be home. Of course, Sky had slept most of the way and was ready to play! It’s been a few days now and the barking is less and she’s getting used to the crate more and we’re getting more sleep. I think I’ll survive this. And much like Aaron predicted, the puppy had won me over before we even made it home. friends and family. I hope you are able to enjoy this alternative. Wow. I was not expecting such a nice day today. I guess it was -1 to start, but I didn’t make it out to camperland until almost noon and it had warmed up. 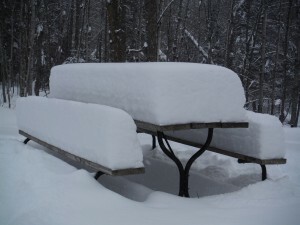 Lots of snow still on the ground, but we spent the afternoon outside and even had our first campfire lunch of hotdogs at the picnic table. The river has started to thaw. The iron-tinted ice was cool. Even cooler were the turkey prints all over the yard…mixed with deer and other animals. We took a walk across the bridge into the woods and found lots of fairly deep powdery snow. Kids even got a little sledding in before we left. Can’t forget the stop at the Donut Shop this morning for treats after being spoiled at Bill and Babe’s. The kids loved their Koala cookies. I think Wednesday enjoyed the day too. She got to run around and even found last year’s bear skull to haul around. Now we’re on our way home. Even though the drive is long, I’m reminded of why I do it. I love it up there. I love being outside. And I love teaching the kids to enjoy it too. 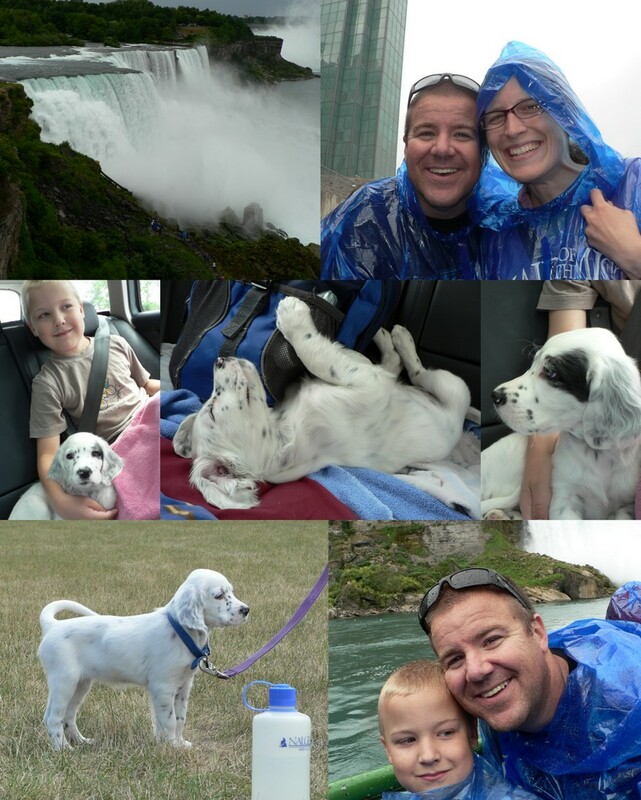 It’s been a week of fun for us with the kids. Lots of outdoor time. Too bad the weather is turning even colder now. Back when we were planning for the San Francisco trip, I got side-tracked and decided a trip to Duluth for Christmas would be fun. I got us a great mid-week deal on a room at the The Edge. The kids loved it last summer and it was even more fun this time. We spent two nights, had bunk beds for the kids, and could barely drag them away from the water slide you ride on the tube. 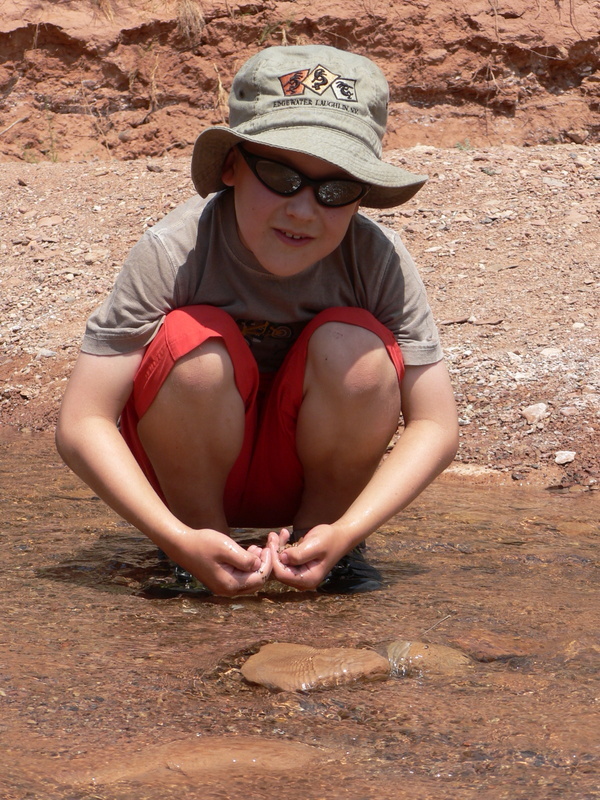 Both kids were much more comfortable and confident in the environment. In a couple years, they probably won’t even be waiting for us to catch up. Our trips to Duluth always have a variety of things going on and most are spontaneous plans. However, this time we did have another planned adventure. We had train tickets for December 23rd to go from Fitger’s down to Bayfront Park to visit Bentleyville. We said hi to my cousin Rachel who was working at Wintergreen and then rode in the upper level of a double-decker train. Bentleyville was a pretty cool production. There were tons of light displays, including Enger Tower and an ore ship going under the Ariel Lift Bridge (while you could see the real bridge lit up nearby). We saw Frosty and Santa’s reindeer walking around, had hot chocolate, cookies, and even toasted marshmallows over a fire. The kids waited to see Santa and tell him what they wanted for Christmas. Bode told Santa “anything you want to bring me is fine”. They got hats and cookies from Santa and we took the train back. Earlier in the day, while the waterpark was closed, we went out to find some fun. We ended up at UMD. We did a little shopping for some UMD merchandise and talked about how this was where mom and dad met and had gone to college. Bode asked to see our classrooms so we took a little walk around. After that, we continued on our way over to Superior. 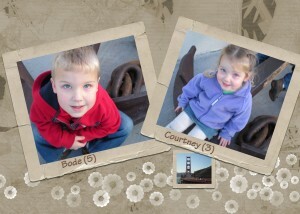 The last couple times we’d been up, the kids had wanted to go across the bridge to Wisconsin. It’s sort of a novelty to cross the bridge and be in a different state. We met up with my friends Molly and Grant for a good lunch at C’s while we were over there. 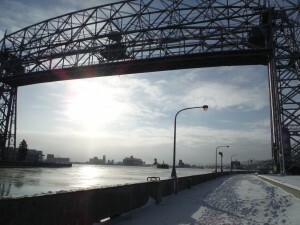 After a quick trip to Northwest Outlet, we headed back to Minnesota and down to Canal Park. With a strong wind and cold weather, the area was empty. Parking was great and we played around for a bit before heading back for a little swimming. The winter weather had started as we got ready to leave on the 24th. We left a snowy Duluth and headed home to Rochester for some snow and rain. It was a fun family vacation. Last year we received a Christmas letter with something like this. I enjoyed it and decided to do one for our family. Merry Christmas and Happy New Year! Airports – With a few trips this year, the kids got to spend some time hanging out at various airports. Much like Aaron, they enjoy seeing the different airplanes that are waiting around or taking off. Bode has a number of toy airplanes that he flies around. Bikes – Bode learned to ride his bike this summer without training wheels. He navigated up and down the hills around our neighborhood. Courtney got her first bike and rode around like crazy with her training wheels. 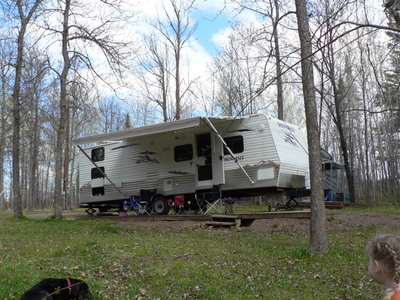 Camperland – We spent a lot of time escaping to our property near Moose Lake. We love spending time outside walking in the woods, driving 4-wheeler, fishing, and playing with dirt. Aaron likes to mow the lawn and organize his shed. 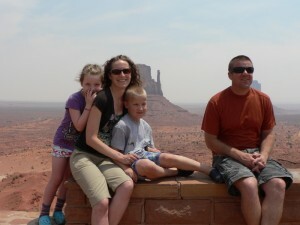 The kids call the place camperland since we stay in our camper trailer on our land. Makes sense to me. Duluth – We took several planned and impromptu trips to Duluth this year. The whole family enjoys it. We rode the Northshore Scenic Railroad, hung out in Canal Park, played at the Park Point beach, hiked at Chester Bowl, inline skated, walked around, rode bike by the Aeriel Lift Bridge, watched ships go in and out, and visited the water park. Can’t wait for the next trip. Eggs – The kids love to eat eggs, especially hard-boiled. Flowers – The kids love finding wildflowers in the woods. Bode also did a good job growing marigolds and sunflowers from seeds this summer. He was responsible for making sure we kept them watered. Green Day – The kids love music in the car, particularly the Green Day song Misery. It’s a little quirky but has been good for settling Courtney down in the car since she was a baby. They request it nearly every morning. They love the “city by the bay” reference. Hockey – Bode has started with the mite hockey this year. He is learning to skate and improves every week. Courtney has been learning to skate too and looks forward to playing hockey next year. Going ice skating is a great family activity for us. IBM– Yep. We still work there. Aaron is a project manager and I lead a development support team. Jumping – Skydiving took a back seat this year in favor of other weekend activities. Aaron managed to get a few jumps in and do a couple 4-way competitions. I didn’t make any this year but did take the kids out to the drop zone to watch Aaron jump one day. They loved watching it. Kindergarten – Bode started kindergarten this year. He is doing a great job and having fun. Leaping Leprechauns – I don’t know what to put for L! Courtney knows all of her uppercase letters now, including L.
Mayo Civic Center – We enjoyed a number of concerts with friends at the Mayo Civic Center this year and plan to see more next year. Some of the bands we saw were Shinedown, Halestorm, Staind, Chevelle, Hinder, Theory of a Deadman, Black Stone Cherry, Mudvayne, Saliva, Nonpoint and In this Moment. New Horizon Academy – The kids started going to the New Horizon Academy daycare this fall. They’ve made new friends and adjusted well. It helps that some of their friends from their old daycare also go here. I love that they take care of getting Bode to and from school. 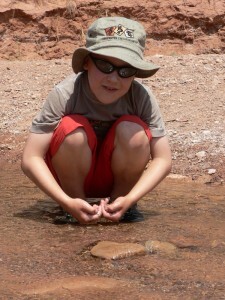 Outside – The kids love outdoor activities. 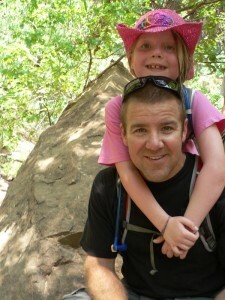 We fit in a camping trip with friends and enjoyed Forestville/Mystery Cave state park. They also loved going out on the boat to ride around, swim, and go tubing. We also spent a lot of time riding bikes and walking the dogs. Pugsley – After 9 1/2 years, Pugsley is no longer with us. We miss him. Quiet – Not a lot of that around here. Reading – Bode learned to read this year. He amazes us with everything he reads around us. Don’t even try to spell something thinking he won’t know what you’re saying! It’s fun. I read a number of books this year and love how Courtney wants me to read out loud to her no matter what book it is. She listened to quite a bit of The Edge of Never. Skiing – Ski patrol on Saturday nights at Welch Village keeps us busy and having fun. Both kids enjoy skiing. They did a great job on the hill already this year. We look forward to skiing with them for years to come. Let us know if you want to come out and ski with us. Trains – The kids loved riding the pizza train in Duluth. They also spend countless hours setting up tracks in the house. Utah – We enjoyed a good winter vacation again in Utah. We got lots of skiing and the kids got a week of grandparent adventures. I’m pretty sure the grandparents needed a vacation after that! Venison – Aaron replenished the dwindling supply of venison in the freezer this year. It wasn’t a trophy deer (thankfully or we’d have another wall mount), but it fills our bellies. 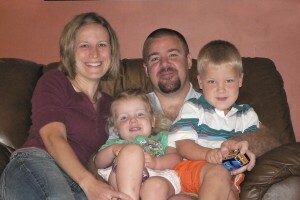 X-ray – We had a healthy year without any broken bones or x-rays. Yellow – This has been Bode’s favorite color for a long time. Zoo – Aunt Margaret entertained Bode and Courtney at the Minnesota Zoo in September. Aaron and I met up with them and enjoyed the animals too. We spent nearly a week up at the camper and are back before the 4th of July. Bode absolutely LOVED riding in the tube behind the boat. He decided Dad was a better boat driver than Mom. Mom’s ride was too scary. Oh well…I ended up riding in the tube a lot with him and with Courtney. She thought it was great fun and didn’t want to go too fast. I did learn to take my wakeboard run first. Otherwise, my arms and hands were already fatigued when I tried to wakeboard. The weather wasn’t super warm, but we got a number of boating times in. Aaron’s aunt and uncle were super nice and even put Courtney to sleep in the boat a number of times. She has a tendency to fall asleep when the boat starts running. The kids enjoy being at the camper. Bode did tons of coloring and it is fun to watch his choices there expand. He also is getting to be quite the reader. It’s amazing to me, but he can make his way through a number of easy books. He tries to read EVERYTHING…shirts, signs, etc. Riding in the car with him is like having a police officer in the back seat. He tells you what all the signs say and lets you know about the solid and dotted lines and what you should and shouldn’t be doing! It’s fun and funny. Courtney loves riding on the 4-wheeler and, much like the boat, has a tendency to be lulled to sleep on it. Once again the dogs did not get on our good side. I let them out of their kennel one morning and within minutes had encountered a skunk…again. Arghhh! Stinky dogs. They’re not too bad now. We came back early so Aaron could go skydive with some friends that had been bugging him to compete on a team for the weekend. We’ll join him at the DZ on the 4th for a day of fun hanging out and visiting with friends. Eventually Monday morning will roll around and I’ll be back to reality. Until then, I’m enjoying this time away from work! Bode and Courtney enjoy watching flowers float down the river. We spent our first family weekend at “camperland”. The weather was pleasant and we spent a lot of time outside. The kids enjoyed watching dandelions and other flowers float down the river. They also enjoyed shoveling dirt, driving the gator, riding 4-wheeler and hiking around. It made for a great Mother’s Day. They played and played. They even got to go visit a nearby farm that had llamas, chickens, peacocks, ponies, pigs, rabbits, dogs, cats, birds and probably more. There were lots of baby animals to visit. Bode loved the chickens and Courtney thought the pigs were very loud. They were! I don’t think I’ve posted a picture of the new camper yet. Lots more room to live in there than the old one. Also, we’ve managed to keep the dogs out of it so far. They got a kennel and are learning to accept it. 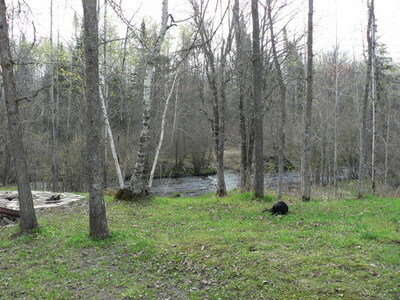 The view from the deck in front of the camper. Beautiful! So long until the next visit.